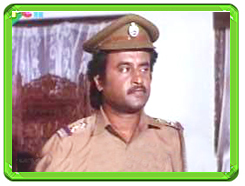 Rajinikanth Film Review From Phool Bane Angaarey. Phool Bane Angaarey Movie. Rajini Film Phool Bane Angaarey. Rajinikanth Phool Bane Angaarey movie. www.rajinikanth.com. Dutta babu is standing for elections against a cunning, corrupt, & established gangster, Bishamber Prasad, who is also powerful and influential enough to swing the election his way, as well as have Dutta killed. Inspector Ranjit Singh gets evidence about Bishamber's involvement in Dutta's death, but his superior officer, DSP Ravi Khanna, prevents him from taking any action. Ranjit then meets with beautiful Namrata, and both get married. As Ranjit continues to be a thorn on Bishamber's side, he is killed, leaving behind a sorrowing Namrata and two children. Namrata pledges to avenge his death, but the question is when a police inspector failed, how can she succeed?.